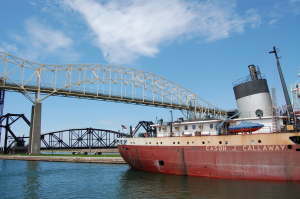 Ride through the world famous Soo Locks! A Soo Locks Boat Tour is a one-of-a-kind experience you'll never forget! Educational, informative and fun for all ages, tour tickets can be purchased online or at our docks. Advance purchase not required. Our tour vessels have a capacity of 150 passengers and we have many departures times to choose from. Advance reservations are highly recommended. Lighthouse Cruise tickets are available online or call us at 906-632-2512 for reservations. For more information and reservations on Luncheon Cruises, Dinner Cruises, Themed Dinner Cruises, Special Cruises call 800-432-6301. Dock #1, 1157 E. Portage Ave.
Dock #2, 515 E. Portage Ave.
Copyright©2014, All Rights Reserved. Produced by Gaslight Media.